Meow, me again. Contrary to what you might think from the title of this post, I did not get in trouble and get thrown in the slammer. Actually, my airplane needed some gas, so I stopped in San Francisco to fill up. It takes a long time to fill up a jet with gas, so I decided to stretch my legs and do some sightseeing. I thought Alcatraz would be an interesting place to visit. I’m actually here looking for imprisonment tips for other felines who have to live with furry beasts. 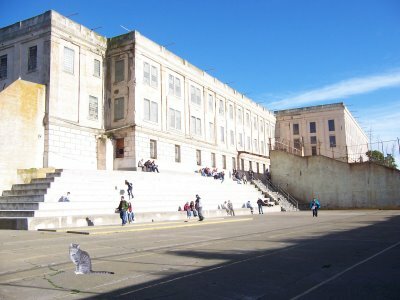 Alcatraz held some pretty hard-core criminals, so surely I can find some secrets to keep furry beasts under control. This picture is of me outside in the prison yard. Oh! My iPhone is ringing, so that must mean my jet is fueled and ready to go! I must continue my journey.